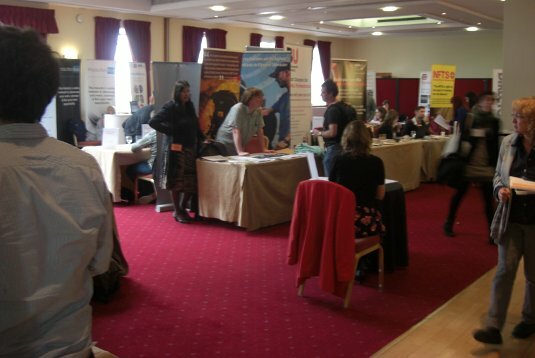 I went to the annual BECTU London Freelances’ Fair 2011 on Friday 17 June 2011 at Savoy Place. In the morning I went to The Freelance Toolkit Workshop – an extremely informative and useful session run by David Thomas. After a peruse around the fair exhibition area (pictured), I participated in two seminars in the afternoon: the first on using DSLR cameras to make film and television programmes (not convinced, to say the least!) and the second on pitching programme ideas (a sort of role playing exercise – very interesting). This year saw a significant increase in attendence compared to last year – many thanks to BECTU’s Writers Producers and Directors Branch for organising the event and to the sponsors for their support.